A flat tyre really gets on my nerves. I absolutely hate the idea of changing them and since I’m now jobless I resent the idea of paying for a new one even more. I only noticed this one as I rounded the corner to home early this afternoon and realised my car was listing at a strange angle. Thankfully I managed to get it re-inflated with my foot pump and it was safe to drive to the local garage down the road. A heavily tanned gentleman (he’s just come back from a holiday in Fuerteventura and said he’d had a ‘bangin‘ time) with reassuring oil beneath his nails and an impressive pair of sleeve tattoos on each arm is looking at it as I type. He seems a cheerful sort despite reportedly having a mild case of post holiday blues. I like him – he’s a smiler. 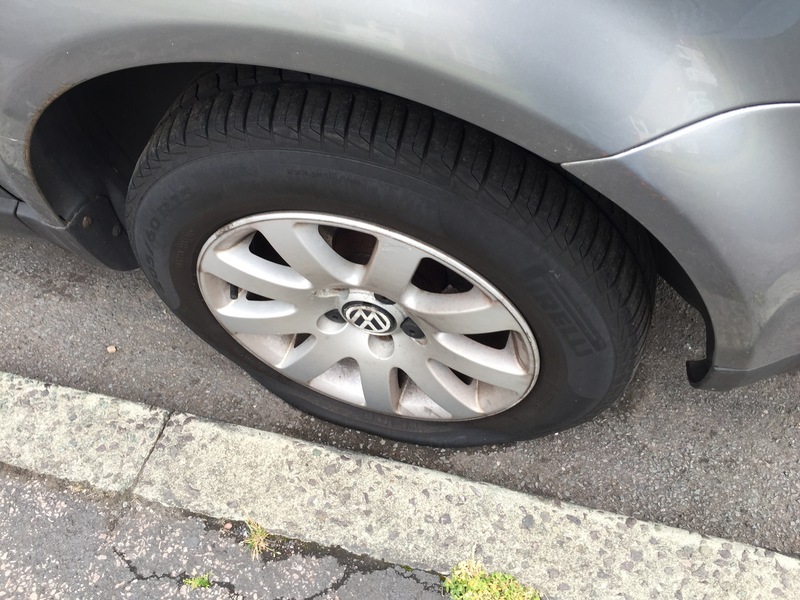 As small a problem as a flat tyre is, when I relied solely on my car for mobility it would have been a complete tragedy. I would have been in a panic about the exertion needed to deal with this tiny life event and worrying about walking, standing, bending, pumping, jacking – basically ANYTHING associated with it. But not today. This morning I’d been working hard toward my weekly goal set in my last post, but still had energy left over to sort out my tyre. When I woke up I was again toying with the idea of going to Birmingham Museum and Art Gallery – but being brutally honest it STILL scares me. I’ve built it up to be much bigger than it is I think – but I can’t seem to get over the fear. I spent ages measuring distances to and from train stations on Google Earth while lying in bed and eventually talked myself out of it. I didn’t know the routes or the gradients and I didn’t want to be verbally abused by idiots again. It was something for another day. So instead I set myself another mini goal. I’ve walked to Leamington before but never without sitting down on garden walls. This morning it was nice and overcast with a breeze but still pleasantly warm. It would be the perfect day for trying something new and if I managed to go the whole distance just stopping occasionally it would hopefully help to increase my confidence a bit. As tempting as it was to sit I managed to do the whole walk in about 50 mins (2 miles) with lots of little pauses but no bums on walls. As I sat in Starbucks contemplating this I looked at my iPhone notepad and checked my movement totals. I needed to walk 30 miles this week (50km) if I wanted to reach virtual France. I want to try and get ahead of myself a bit in case the weather turned bad closer to Saturday or I just fancied a day of rest. I decided the best thing to do was go exploring – not worrying where I was going and just let Apple Watch keep a track of what was going on. That way it wouldn’t be a chore – just fun. I decided first of all to investigate Jephson Gardens. After the Art in the Park festival a couple of weeks ago I’d wanted to have a proper look round – and quite a few people had said how nice it was. Jephson gardens is very a different space to St Nics. It’s extremely Victorian in character – and has a lot more in the way of formal planting and monuments – but also a lot more contemporary art dotted about the place. It’s quite eclectic overall and has some interesting little projects like the sensory garden where children are encouraged to play some cleverly integrated musical instruments (like a dreamy sounding little xylophone) while they explore the plants. Local schools have also got small plots with things like mini marrow patches, and there are also ‘bug hotels’ to promote the local insect wildlife. Some of it looks a bit (ahem) ‘rustic’ – and some looks really lovely! Nearby there’s also a large glasshouse with some Koi in a pond and a whole variety of plants to examine that I’d eaten the fruit of many times (coffee, olives, mangoes) but never actually seen before in real life – which actually really surprised me. There were also some slightly out of season wild flowers just outside – and further down a bee hive with a pollination garden where you could watch all of the busy little fellows going about their business. I also met the tamest squizzle (I prefer that word) that I’ve seen in ages – who was coming really really close to me for a look and then running up and down the tree in front of me before hopping about on the pavement. I love sqizzles. The’re one of my favourite creatures – even though we’re supposed to dislike the grey ones in favour of our indigenous reds – but they’re just too cute for me to hold a grudge. I finally stopped to check out a statue of Jephson himself, standing regally but sadly alone and cut off from his admirers behind a wrought iron gate. At the entrance to the park he was described as a kind but serious man – and if that was the case the likeness seemed bang on. His sideburns alone looked like they were scowling. I couldn’t imagine him being happy if he came home from work and found his wife had failed to prepare dinner. One of the Slimming World ladies (while we were on a walk) had mentioned to me that it was possible to walk along the river Avon for quite a long way, so instead of going back the way I came I decided to try and follow it for a while and walked past the bandstand by the Royal Pump Rooms and alongside the bowling green. The immaculately kept greens were a hive of activity today with many men and women of a mature perspective all wearing bright and gaudy tracksuits while they watched or competed in what seemed like an ongoing and high profile tournament. Mobility scooters and wheelchairs were in abundance and pensioners were zipping about the park in great numbers and crowding into the tea rooms at the end of the green. Shortly after passing the hustle and the bustle however I crossed the road by the nearby sewage plant into an unexpected area of quiet and tranquility. The road noise melted away and a calm fell upon what (to me) was completely new territory. I’d never even noticed there was a footpath by the recycle centre despite having driven past it literally hundreds of times, and before I knew it I was in the middle of fields of sheep. In between Warwick and Leamington there were open fields! I had absolutely no idea! Following this path led me to the canal – which I’m familiar with from where I live towards Hatton, but NOT in the opposite direction. Once more I was in a new place, but I wasn’t on my own. It was a busy route – and there were couples strolling hand in hand, moms jogging with buggies (I’m always a bit in awe of this) and lots of people on bikes. To be perfectly honest – by this time I was feeling the burn. Up until the canal there had been benches dotted around everywhere along the river and I’d liberally taken advantage of them when I needed to. Although the canal was flat it had zero respite, and both my plantar fasciitis and the ligament problem in my left leg were beginning to hurt quite a lot. I really needed to sit. By the time I came close to an exit from the canal I was in a lot of pain – and was beginning to loose the joy of discovery. Until I found THE MOTHERLOAD OF SWANLINGS!!! It seems that they aren’t confined to the park and are managing to remain fruitful elsewhere. What was lovely was that they let me stand right next to them for quite a while, just watching them as they snoozed and gently stretched. Their parents were close by keeping a watchful eye – but I stayed completely still and none of them made a break for open water. They’re not alone. There were also some unreasonably cute ducklings as well!!! And then, just like that I was home. To my flat tyre. However – as I’d only had an apple and a tangerine for breakfast I was far more interested in my slow cooker – which for 20 hours had been making me the perfect beef stew. This was syn free, filling as hell and would ensure that there was no post exercise hunger sabotage going on. It went down a treat. So now I’ve just been given the bad news. My punctured tyre had not one but TWO nails in it – and they were helpfully near the tyre wall making it completely unrepairable. Another was also below the minimum tread depth, so I needed TWO replaced. Bye bye money. Alas. We hardly had time to get to know eacother. I’ll miss you. But I’m not upset. Thats 6.83 miles walked today, taking my total toward the Eurotunnel target (30 miles) to 18. I have another 12 to go and 4 days to do it! This means internet that I need to nail 3 miles a day on average and I’m in Virtual France! I better get my virtual phrase book ready!!! Whoot nearly 7 miles! You go! 😀 Thank you for always sharing lovely pictures of your walks. The place looks positively charming and I love the little video of the swanlings and little duck! it really makes me think I should visit it sometimes :). Well I know that there’s plenty of wind and rain in NL so you’re probably already (almost) acclimated lol – the UK’s got some fantastic scenery! Good to know – although for me it’s become something that I need to dislodge from my brain. It’s less about the Museum and Art Gallery and more about the fact I’m worrying about goings there. Although I too have lots of happy memories of it – so I hope it’s not gone too far downhill! Photos are wonderful – does another career beckon? Anyway, that really is fantastic news with the distance you’ve managed to walk. I’m going to have to do some walking tomorrow now as I’m working from home. Well done!